After raiding a Hydra base, the Avengers secure Loki’s staff, but are unsure what Hydra was planning to use it for. Thor (Chris Hemsworth) is set to take the staff back to Asgard, but agrees to give Tony Stark (Robert Downey Jr.) 3 days to study it. Tony discovers that the staff may be the key to creating artificial intelligence, something he has been working on. Tony’s dream is to create a “suit of armor around the world.” If he can perfect it, the Avengers would no longer be needed, letting them return to their normal lives. With Bruce Banner (Mark Ruffalo) and Jarvis’ (Paul Bettany) help, they are able to create Ultron (James Spader). Ultron is the first step in Tony’s vision. When Captain America (Chris Evans) finds out what they have done, he demands they shut it down. Only it is already too late. Ultron sees the evolution of the human race as the only way to save the planet. The destruction of the Avengers becomes his primary mission so they cannot disrupt his plan. The superheroes, along with Hawkeye (Jeremy Renner), Black Widow (Scarlett Johansson), and a few old friends, must stop Ultron before he destroys the human race. Avengers: Age of Ultron takes elements and characters from all the individual Marvel Cinematic Universe and melds them into one huge super movie. If this sounds like a lot, that’s because it is. Yet, it doesn’t seem overcrowded. In fact, each of the main characters is given equal screen time and everyone is equally important to the story. This is good news for Jeremy Renner and Scarlett Johansson. Hawkeye not only gets some character development, but he actually has something to do in this film. The writers even gave him what is probably the best line in the movie, summing up the entire Marvel universe. (I won’t give it away, because you’ll know it when you hear it. Wait for it near the end of the movie when he is talking to the Scarlet Witch.) For Scarlett Johansson, we finally get some insight into how Natasha became Black Widow. The second act of almost all trilogies is the darkest. Age of Ultron is no exception. But Marvel knows how to handle this. With wit and sarcasm. When I wasn’t in awe at the action and the story, I was laughing. And it’s not just RDJ’s Tony Stark in on the action this time. Everyone gets their digs in. The ensemble, including newcomers to the Marvel universe Aaron Taylor-Johnson and Elizabeth Olsen as Quicksilver and the Scarlet Witch, work well together. James Spader’s haunting Ultron is balanced by the rest of the cast. If I had to find something bad to say about the film, it would be that the story has been done time and time again. Man creates artificial intelligence, which then tries to eliminate humans, as they are the biggest threat to themselves. Marvel even did this in Captain America: The Winter Soldier. Yet, with the constant action and amazing visuals, it can be overlooked. The movie nicely sets up all the upcoming Marvel movies, including Captain America: Civil War, as well as the final Avengers movie. (While there is no “end credit” scene, there is an important mid-credit scene.) Which brings me to my biggest problem with how movies are promoted today. We know every superhero movie being made from now until the end of time. There is no mystery as to how things will proceed, and you know certain characters have to survive. I prefer the old days, where you had no idea where the story would go next, if it even moved on at all. That said, Avengers: Age of Ultron is an amazing movie. I dare say better than The Avengers, as they waste no time at all getting to the action. Other studios, particularly Warner Brothers and their DC Comics movies, should take note. This is how you do superhero movies. When you see it, and I know you will, drop the extra cash for the IMAX 3D. It is definitely worth it. 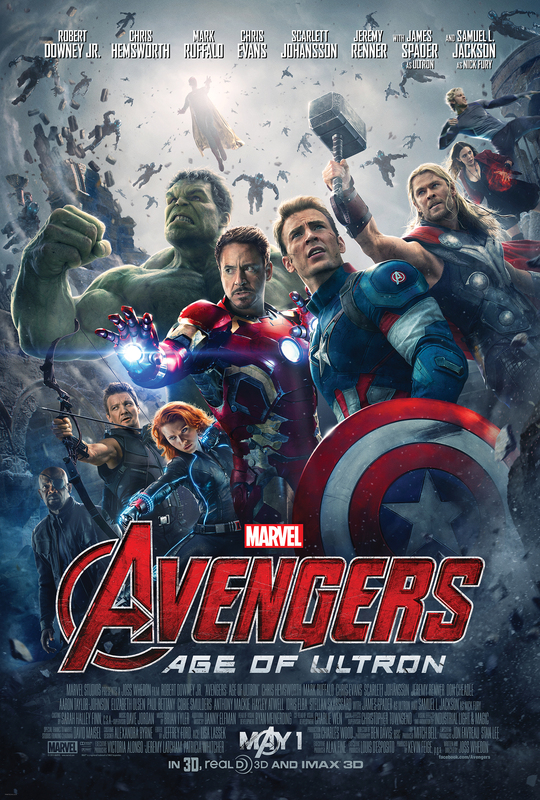 You can view trailers for Avengers: Age of Ultron here, here, here, and here.